Last week I made the trek back to Mississippi to surprise my sister, who was having a baby shower. It was wonderful to see her and the rest of my family. She's 8 months pregnant, so I'll be meeting my nephew in about a month! I can't wait! 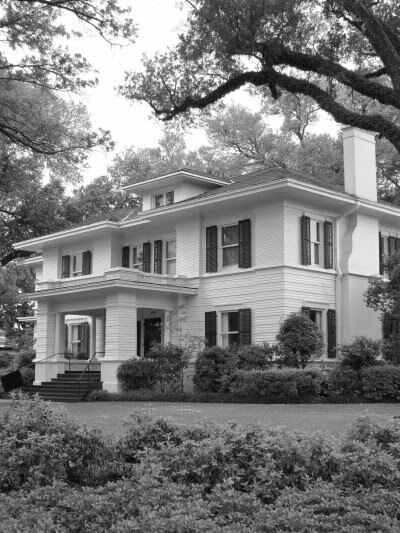 While in Mississippi, I wanted to try to take pictures of things that I felt really captured my city and state. Unfortunately, the weather had different ideas and I wasn't able to take nearly as many pictures as I had wanted, so I only have a few to share for Fired Up Friday this week. However, I do have a nice ghost-ish story to go along with one of my pictures. First up is a picture of a Magnolia bloom I took. 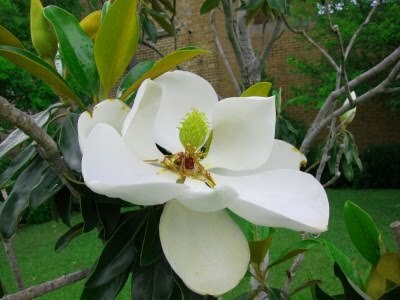 The Magnolia is the state tree of Mississippi and most Mississippians are very proud of it. I never really noticed how many Magnolia trees there were until I started looking. And now, for my spooky story. For years throughout high school and college I had a recurring dream. In the dream I was in a big, abandoned looking house and was running from something. I never knew what I was running from, just that something was chasing me and OMG I NEED TO GET AWAY NOW. So while I'm running from the OMG thing, I always find myself face to face with a door and nowhere else to go. I open the door and find a staircase that is so steep it seems to be vertical instead of at an angle. I decide that it's a fantastic idea to climb the stairs (What's up with people in horror movies going UP stairs instead of OUTSIDE?). What's at the top of the stairs, you ask? I have no idea. I always, ALWAYS woke up mid-climb. In college I was a bridal consultant. I was the happy, smiley lady in heels that helped you try on dozens of dresses only for you to decide you don't like any of them. I'm not bitter or anything. We often had to do promos for the store such as photoshoots, commercials, etc. This particular day we were filming a commercial in what's known as The Green House, an old house in the historical district of town that's used for weddings and things. Upon arrival at The Green House, I didn't feel well. A sick, nagging feeling at the pit of my stomach. I couldn't explain how I felt, just that I felt "off." Long story short, the house itself bothered me. I knew it was going to be a long day. We went upstairs and each got dressed in our wedding attire. My dress was very simple to put on, so I decided to do some exploring while the other girls were busy primping. As I'm walking, I see a door and have the strongest urge to open it and snoop. I keep telling myself not to, but I look down to find my hand slowly reaching for the old fashioned crystal door nob. The nob twists with an audible "squeek" and the door swings open of its own accord only to reveal MY STAIRCASE. The staircase that has haunted my dreams for nearly five years. I step into the small foyer area and the door closes behind me. GULP. Nowhere to go but up. It takes me a while because I have on a freaking wedding gown. I make it about halfway up the stairs when I hear people frantically calling my name. Stupidly, I turn around and descend the stairs. I make it through the commercial, but my mind is a-flutter the entire time. After the shoot, we go back upstairs to change out of our dresses and back into work clothes. I'm the first one finished again and snoop around the parlor room we're changing in. In it I find three death portraits. Death portraits are paintings (or sometimes photos) of the dead used to memorialize them. You've all seen one at some point, I'm sure. One is of a perfectly lovely looking young lady, not so different from myself. The other is of a terribly ugly (and I mean UGLY) older lady with dark hair and a dress collar starched to the heavens (she reminded me of the evil stepmother from Cinderella), and the last is of a little person (is that the politically correct term these days?). Yes, I'm serious. He looked to be in his 30s or so. I'm guessing Evil Stepmother was the mother and the other two were her two children? I'm not sure. They sparked such an interest in me that I took pictures of all three. I'm sure you're expecting to see those pictures now, but you won't. Not because I don't want to show them to you (because good gosh I do! ), but because I don't have them anymore. Sometime last year I remembered them and went to find them on my laptop... and they weren't there. I posted this story on a forum I went to at the time, and I even dug through the archives of that forum to find my post... and they weren't there either. Yikes!!! Looks like Step Mother didn't want me sharing photos of her and her children!! And what's at the top of the stairs, you ask? I have no idea. Just like in my dream, I never made it to the top. I should have ignored the frantic calls from my co-workers and climbed to the top anyway. I've chastised myself over it for years, but recently come to terms with the fact that it's almost fitting. I never found out in my dream, so why should I find out in real life? I have a feeling one day I'll sit down and write a novel-length story about what's really at the top of the stairs. I do want to know, and one day I will find out, even if it's fictional. What do YOU think is at the top of the stairs? And what has inspired you this week? Out of that whole post what truly grabbed me was the phrase about "...happy, smiley lady in heels". I just love that image, the Vaseline smile, the washed pleasantry, and the exasperation hiding just below the surface of every comment.